Back Support Chair, Lumbar Support Chair online with Price, Manufacturers, Suppliers, Traders and Companies in India. Assisted ourselves with a squad of hard-working professionals, we have been able to provide an unmatched quality range of Adjustable Chair Back Support. 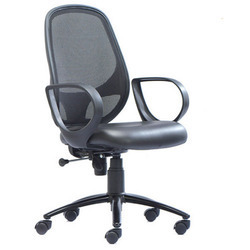 To complete the diverse necessities of our customers in the best possible way, we are occupied in providing best-in-class Low Back Office Chair. These Back Office Chairs amplify the look of the office with its awesome look and are made of finest quality raw material to make it durable. These chairs match the office environment perfectly and also give lot of ease sitting on it while working. These chairs are also adjustable by height and elevation and the wheels make it easy to move from one corner to another on any surface. - The Leather Upholstery, Chrome Plated Armrests, and Polished Aluminum Base give your workplace plush aesthetics. - With More Design Choice you get a product that best suits your comfort, taste in aesthetics, and functional needs. - The Knee-tilt-Mechanism provides a higher level of ergonomics and superior comfort. 8" low profile, breathable mesh construction.